Nakivo Backup & Replication is a popular, enterprise-class backup solution that focuses on VMware, Hyper-V, and Amazon EC2 environments. This article will show you how to install Nakivo Backup & Replication on Ubuntu. I am using Ubuntu 18.04 on this article and it should support Ubuntu 16.04 as well as Ubuntu 18.10. First, download the free trial from this link. You will get a new file called: NAKIVO_Backup_Replication_v8.0.0_Installer_TRIAL.sh. Once you have the file, let’s install it. Type “Y” and then press Enter to accept the EULA. Next, type “S” if you want to choose Full Solution (Single Tenant). 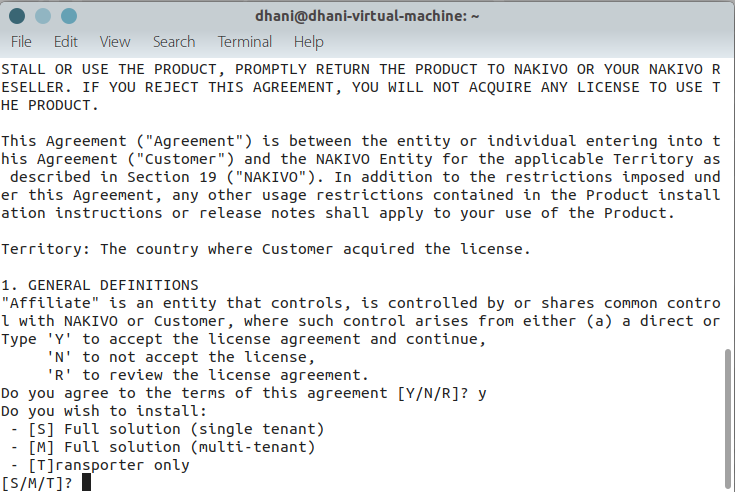 In this example, I choose S to install Nakivo full solution single tenant. The full solution will install both director and transporter. Configuring the Director. We are going to configure the Director installation. In most cases, the default value should do. Change the port number with your custom port number if you use the custom port number during installation. Create a new account to access all features in NAKIVO Backup and Replication. Click Proceed to enter the web interface where you can manage the backup tasks.